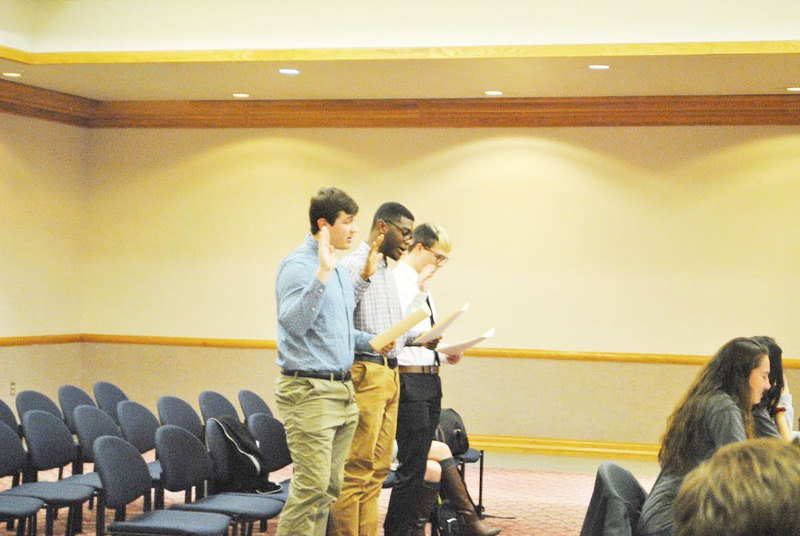 New student government senators Ryan Clark (left), Kyle Quartes Jr. (center) and Brant Durham (right) get sworn in during a Feb. 4 meeting. 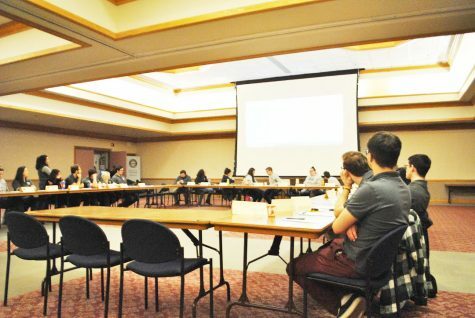 Pitt-Johnstown’s student government is to have new leadership as elections are to be held next month. Student Experience Committee Chairman Devin Seiger is running for president with Student Involvement Committee Chairwoman Tessa Fry as his vice president. Treasurer Olivia Albert is also running for president with Secretary Rebecca Stefanyak as her vice president. Whichever team is elected is to take over for President Sam Miller and Vice President Gretchen Shepard, who ran unopposed last election. 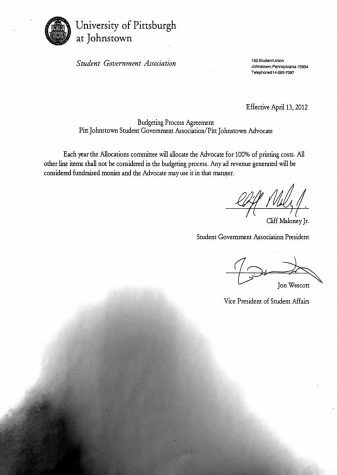 According to Miller, candidates are required to submit petitions with a combined 250 student signatures to be on the ballot. Students who wish to become senators also must submit a petition, but are required to have only 75 signatures. Seiger said he is confident that he and Fry will have a successful election, but has confidence that whoever is elected will continue to improve and expand student influence. “I decided that I felt comfortable in my ability to lead, and I wanted to get a chance to continue the good change that has been going on under (Miller),” Seiger said. 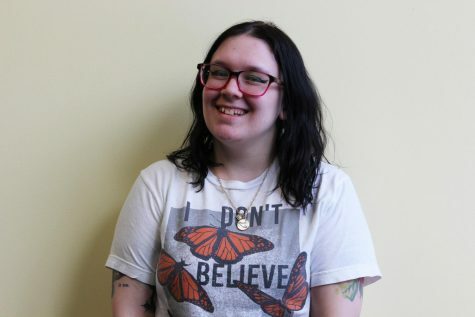 Fry said she and Seiger decided to run for president and vice president after having a conversation and deciding they would have a good impact on their peers. “We wanted a competitive election this year,” Fry said. 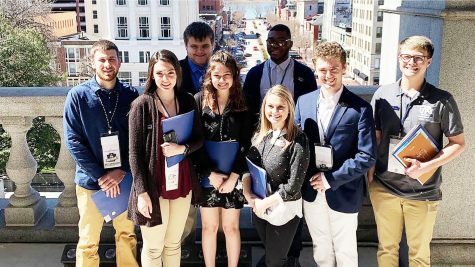 Executive Board members, such as the student government secretary and treasurer, are appointed by the president and vice president or senators. Stefanyak said she and Albert were inspired to run for president and vice president after they were named Allocations Committee co-chairwomen. “From the beginning, we worked well together and were able to make positive changes within our committee,” Stefanyak said. She said she is excited to have the opportunity to run for vice president. “Ever since I became a (student government) senator my freshman year, I fell in love with the idea of making a difference on campus and helping students have the best experience possible here,” Stefanyak said. Stefanyak said candidates who do not win the election are either appointed or voted on to the Executive Board or become regular senators. 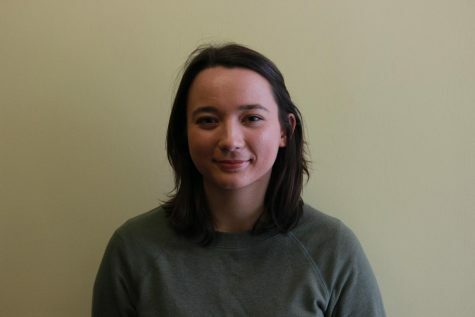 No other senators have announced plans for running for president or vice president, but Stefanyak said there are many student government members who are qualified for either position. “We have many strong and qualified members who would be more than capable of running,” Stefanyak said. When voting for elections is open, students can vote for president and vice president by signing into Campus Services. 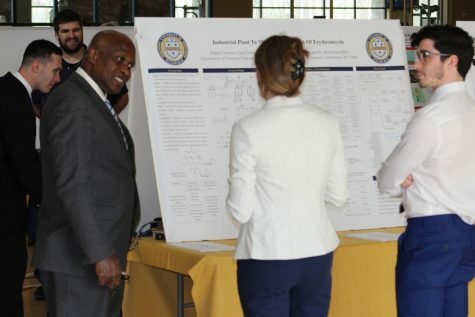 Senators who collect their required signatures automatically become student government members again without an election unless there are more candidates than open seats.